One of the most significant statements made and resounded by many, many people worldwide has been . . . Energy is the driver of all economies in any society worldwide, no one can change that. Economic issues directly related to energy are the key drivers of peace or conflicts in world societies. Not “enough” is said, discussed or spearheaded about the importance of this statement yet its effect is a challenge to every country in the world. This statement is not something to be pondered passively but pondered excessively and today development of “clean energy” is the topic of most countries throughout the world. The uncontrolled costs of energy over many years have contributed to the loss of many U.S. manufacturing businesses with their competiveness in a cost critical growing worldwide economy. The costs for power for heavy manufacturing can run anywhere from 7% to 30% of their operating budget. If the government doesn’t provide “stable” costs for industrial energy our industries cannot compete with other countries. The energy industry follows the path of public policy advocacy from the top down. This works if you have scientific integrity follow through between the science, politics and the media but if you don’t, “misrepresentation” will outweigh the truth and confuse the citizens. The energy industry needs to educate the citizens but this may be better served by using grassroots pro active organizations as the messenger. If GE, Westinghouse holds an “open public meeting” concerning solar, wind bio-fuels or nuclear 1/3 of the public may not even attend because the “openness” may be perceived as weighted toward GE or Westinghouse by the public. If your city holds an “open public meeting” on the parks & recreation department planning . . . how many of you “really” feel it is an “open meeting”? The public perception of the political process is normally skeptic, pessimistic and most often mistrusting. At the same time in respect to energy, its costs, theoretical atmospheric damage and importance to world economics, it is ever more critical that public education and awareness be communicated to the citizens. The science and engineering community have a difficulty communicating their advances to citizens. People by nature develop a language of acronyms relative to their realm. In their environment it’s used and understood commonly among their colleagues, out of their realm it often presents confusion making the intent of the communication difficult for the public. The government’s involvement in our science, engineering and university systems further complicates this process of getting truthful science technology to the public. The science and engineering of energy projects is not what the citizens are exposed to. Like many other national issues, energy science and engineering is controlled by government and media misrepresentation of scientific truth. America supports some of the best “national laboratories” in the world for the purpose of “advancing” our technology. Unfortunately the management and directives of our laboratories is controlled by politics and not the scientific administrators as they should be. Because of this process our national laboratories are subject to direction changes every four years with administration changes. This does not “serve” the public. It is estimated that up to 60% of the political representatives in China are scientists or engineers. China is becoming one of the largest “industrial manufactures” in the world because of advancing science and educated labor. America has allowed its industrial capacity to be moved offshore in lieu of our “information society” (we don’t have to work anymore, we know everything). Now, we are finding that our information has been misleading, untruthful and inaccurate result . . . very costly to our society. We don’t “build” things anymore . . . we “talk” about things and it’s hard to expand an industry of “talk” without having a real product to sell to a world market. America needs to recapture the manufacturing of industrial “products” . . . and diversity. We have to re-invent manufacturing in America with science, educated labor and energy, build American . . . sell foreign. Wood, coal, oil, gas, liquefied natural gas etc. have been the energy sources of the 19th and 20th centuries. They are responsible for the world’s industrial age. Today we have learned that they have become a potential atmospheric problem. Although the politics and media claim carbon emissions and their effect on our atmosphere are absolute, this is still not “proven” in the complete science community. All of the fossil fuel energy sources developed over the years because of the easy accessibility to them and the technology at hand. Coal replaced wood because it was much more efficient in its heat output for its mass and so on through oil, gas, etc. Solar, wind, bio-fuels etc. have been “want-a-be” energy sources for the past 100 years but remain twice to three times as costly to produce high volume energy as fossil fuels and cannot begin to compete with nuclear energy. In every beta test site of solar, wind, bio-fuels we have tested over the past 50 years none have proved economically “competitive”. Until they are, any and all government subsidies, tax credits, cap & trade programs, etc. will do nothing but increase “your” cost of energy. The Pickens windmill plan, he canceled in 2009 (was going to need) 1,200 square miles to generate 4,000 MW of power planned in Texas. Only a 25% energy return is projected and the project was based entirely on tax credits. Pickens, GE and many of the “energy” companies are only moving towards renewables because the government is doing the handouts from “your” taxes and they are “taking” them. Credits and subsidies are usually “paid” by the rate payers, “you” well, aren’t you being nice? The highly discussed topic of Green Energy is going to require “socioeconomic acceptance”, meaning, society will have to accept that the development of wind, solar, etc. will increase your electrical power costs. This is ok for the affluent portion of our society but it will be very difficult for low-income and fixed income people in retirement to manage their ever increasing energy costs, and continue to be devastating to U.S. industrial manufacturing energy costs. Ironically, the greenest renewable energy source is nuclear, its science is a no-brainer proven technology zero carbon emissions; its public perception is mostly a lie perpetuated for the past 40 years by ill informed environmental groups the media and government. Every other industrialized country in the world is developing nuclear power plants because they understand the need for low cost energy to drive industrialization competitiveness. GE is a company with divisions in “media entertainment” renewable energy and “nuclear energy”. Now, because of the current administration providing tax incentives and subsidies for renewables, GE is moving their nuclear engineers over to their wind turbine division. This is how government re-directs the flow and private industry accepts the funding the average citizen will see his energy costs quadruple and/or his cap & trade subsidies double over the next few years. Administration politics manipulates our energy direction instead of the science that should manage it. Materials, publications and communications sources on energy science to Joe Citizen are directed by the politics instead of advanced by the actual scientific data itself. The United States as well as other countries over the years invested in “national laboratories” established and run by our government in pursuit of advanced technology to serve mankind. As with most government managed agencies, the science & engineering communities are reorganized by politics at every administration change. This results in an agenda based on the politics rather than the science. In the best interest of our citizens, something has to be done to remove “agenda politics” from our national laboratories. Re-direction of our science every four or eight years is not conducive to advancing our technology. America needs to develop an “overseeing” mechanism for many of our “agencies” by “private sector” industries driven by cost effective economics and not agenda based politics. The science & engineering communities are often strained at communicating their technology to the public in a method that our citizens can learn to become an advocate. As we advance our science we must keep the public abreast of technology so that they can advocate on the side of science and not politics. Many of the problems with “citizen awareness” of science and engineering advancements have been the result of misrepresentation of issues by the media. Sensationalizing stories is much easier to “sell” than technical science articles to the public. The media authors have their “history” graduates or “political science” reporter’s but few mass publication science editors today are scientists or engineers themselves and this has affected our technology reporting on a worldwide basis. Thirty plus years ago the discussions about spent nuclear fuel reprocessing were centered on costs and its recovery science, this discussion remains today at the forefront of this entire process. The science over this time has narrowed the process down to two different methods which are currently competing for the final direction. A “Commercial size” reprocessing facility for the U.S. today remains an unknown cost entity in respect to the first ever, “one up” major scientific project. It is for these reasons that a government backed research and construction program has to be assembled with a highly motivated private company. We should remember that programs of this magnitude are extremely comprehensive. There are “states” in our country which have some of the most technically sophisticated private corporations on the planet. Nevada is not one of them. 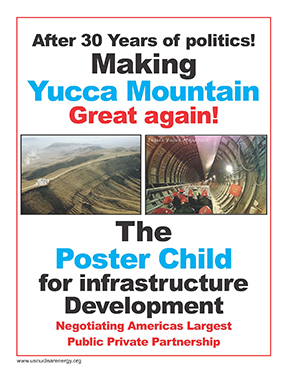 To a sophisticated major technical corporation, the aptitude of Nevada’s business climate and political opposition to Yucca Mountain, and spent fuel reprocessing is not very appealing. The science of spent fuel reprocessing is not about nuclear fission or fusion but mostly to do with altering, controlling and changing the radioactive chemical states of the spent material. After processing these separations some 95% of the “materials” become usable for “new nuclear fuel” medicinal isotopes and several other recycled applications. Ultimately, only some 5% is left as unrecoverable radioactive waste which must reside in permanent deep geologic storage. A number of technology companies are interested in spent fuel reprocessing. The problem remains however the necessity of a marriage with such a private company, the U.S. Department of Energy, the Nuclear Regulatory Commission and public and private financing. Once again our ultimate resolution is faced with private sector, government agencies, politics and money. The resolution of problems with such massive magnitudes can only be done with an earnest effort from all of the participants engaged. With all of the engineering, science and talk about reprocessing when concluded, at the end America and all other developing countries on the planet will still need permanent nuclear waste repositories for that absolute end of the line. This is, and always will remain necessary. Much technology advancement is delayed by partial roadblocks instead of forging ahead to conquer a resolution. Yes, water in the west is scarce but nuclear plants don’t “consume” all of it, they use it as a coolant and return it. Its consumption is limited to driving the steam turbines for the electricity but all of the coolant circulation is returned to the source. This “use” renders absolutely zero contamination of the water. In the case of the Arizona Palo Verde reactors, their water source is from the Phoenix waste effluent water supply and the plants pay dearly for its use. Yes, today’s “pre-approved” reactor designs are water based standard and high pressure reactors. Yes, these could be built in Nevada, and YES with all parties “aligned on the same page” new reactors can go online in 4 to 6 years of construction. Today’s 102 U.S. nuclear plants provide 20% of our electrical energy. This accounts for 70% of our CO2 carbon free emissions. Nevada and the western states are woefully behind in “self sufficient” energy production. In the past five years NV Energy has made considerable advances in generating from 60 to 70% of Nevada’s power, prior to this they were purchasing nearly 50% from out of state sources. Nevada has good possibilities for geothermal production but the geothermal plants are most productive if near the metropolitan consumption source. A 500,000 volt transmission line looses 10% of electricity every 60 miles from heat dissipation; long distances may see only 7 to 10% of the power arrive at its destination. All energy sources suffer significant power losses from long distance transmission lines. Systems use transformers to “boost” the lost power back up but these transformers themselves “consume power to boost it”. Another alternative is moving towards the 4th generation high temperature reactors which use salt, metal or helium as the coolant. These designs use about half the water as the conventional water cooled reactors. Test reactors of this type have been built and operate successfully but the U.S. NRC has not yet “pre-approved” these advanced designs for commercial scale fast track construction. These high temperature fast reactors are also the “most suitable” generation systems for hydrogen fuel production in the future as the manufacturing of hydrogen is very energy insensitive. From a recent book, Terrestrial Energy, William Tucker, Bartleby Press, 2008, 1-MW equals a million watts, the commercial standard to power about 1,000 homes. Small Laboratory reactors in our university systems range about 1-2 mw in size. Our nuclear navy submarine plants 20 & 50 mw of power, battleships & carriers 70 to 100 mw. Today, Russians are powering Siberian villages with 80 MW nuclear plants floated into the villages on barges. China & Japan are building 150 MW nuclear plants for remote communities. All of these types of developments are designed to provide cost effective energy to help “grow” small secluded remote villages. Barstow, CA SEGS Solar Electric Generating System was a project 100 acres of 40’ high movable mirrors to stay with the sun focused to heat Therminol to 1500° C to generate steam for power, 354 MW. The problems were maintenance 10 million Sq feet of mirrors needed to be washed every 5 days . . . fires caused by explosions ignited large quantities of therminol. The Luz Company went bankrupt in 1991. The difficult part about public perception is its misrepresentation. The Three Mile Island accident produced a plethora of information and learning about plant operations. They learned that there was a serious mismatch between the plant technology and human error. In the 1950s 80% of all industrial accidents were caused by human error “not” industrial machinery malfunction . . . learning this brought new disciplines to engineering psychology. By 1965 standards for “safe human factors” were established and implemented for all industrial plant human interface environments. The Three Mile Island accident help perpetuate engineering psychology changes for the entire industrial machinery industry. No other industrial sector has a better safety record than nuclear power plants, none. With little doubt we all have to work towards cost effective green energy development and construction, reduce CO2 emissions and construct new base load energy plants. Conservation will help but only help so far, the demand will continue to increase. Most states have Public Utilities Commissions for the purpose of overseeing the actions of the utility companies are “fair” to the public. Such watchdog agencies will soon become completely dwarfed by the administration’s proposed Cap & Trade program to reduce carbon emissions. Hit hardest will be the “95% of working families” the administration keeps mentioning, usually omitting that the no-new-taxes pledge comes with the caveat “unless you use energy.” Putting a price on carbon is regressive by definition because poor and middle-income households spend more of their paychecks on things like gas to drive to work, groceries or home heating fuel. The Congressional Budget estimates that the price hikes from a 15% cut in emissions would cost the average household in the bottom-income quintile about 3.3% of its after-tax income every year. That's about $680, not including the costs of reduced employment and output. The three middle quintiles would see their paychecks cut between $880 and $1,500, or 2.9% to 2.7% of income. The rich would pay 1.7%. Admittedly, the U.S is one of the largest carbon contributors worldwide. Moving in this direction will further diminish our ability to compete with industrial manufacturing on a global marketplace. Reducing our emissions is amicable but discussions with other major countries are not committing to the reductions and the effectiveness of this mission must be done on a global basis. Our economic sacrifices for Cap & Trade emissions goals will be dwarfed by China in a massive industrial expansion mode. They are building nuclear plants, but also a new coal fired plant every month. This is why they are not going to sign up for CO2 emissions limits. Everything eventually comes down to money and politics. If we don’t marry them for an affordable energy future the future will not be affordable.